The Aurora Cemetery was established in 1869, and is a fine example of a Victorian period “garden cemetery”. A “garden cemetery” refers to the symbols and designs used on memorials and include such icons as angels, lambs, roses, vines, etc. Our peaceful setting is embellished with our majestic trees, mature surroundings and well kept grounds. 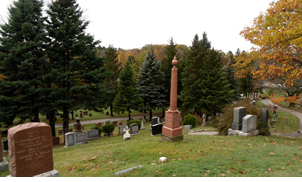 We have 29 acres of winding roads, towering monuments, along with birds and other wildlife bringing comfort to families as they visit loved ones or visitors that are searching for family genealogy, as the cemetery is an invaluable source of genealogy information. In the middle of September it is an experience to attend a candlelight service for the veterans; it is a vision of beauty as the members of the Fred Tilston Aurora Legion light hundreds of candles at dusk to pay tribute to the many men and women who served their country during war time.